It's time for some valutions. 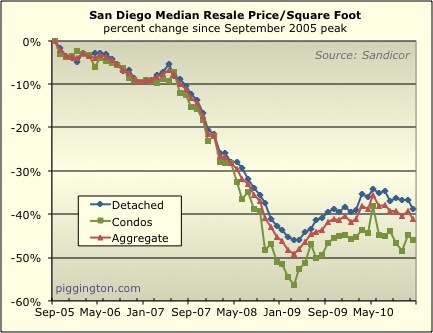 The charts below show San Diego housing valuation ratios updated through year-end 2010. 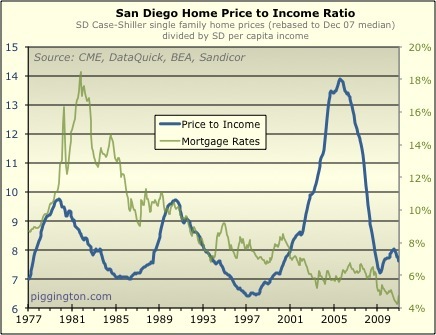 Let's start with the price-to-income ratio. The decline in home prices since the summer brought this ratio back down to 7.6 -- right in the middle of fair value territory per these ratios. 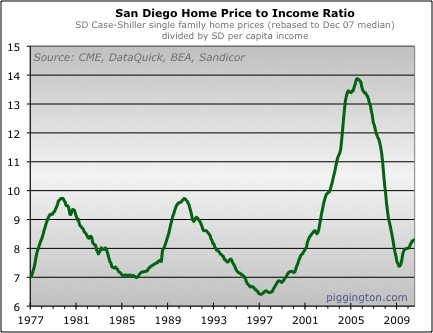 In fact, it's 5% below the median price-to-income ratio over this entire period (which incidentally is 8 on the nose). Someone please tell science to get on it. For now, we'll have to make do with the January resale data. Well, so much for the spring 2010 double-tax-credit-stimulated rally. The last of the effects of that entire affair have been wiped out with the latest month's drop in the median price per square foot. Prices by this measure were down in December by 3.5 percent for single family homes, 2.4 percent for condos, and 3.0 percent in aggregate. 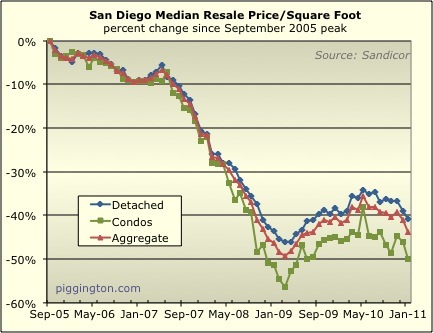 This brings the overall median price per square foot down to 1.2% lower than it was in December 2009 -- the first year-over-year decline in this price measure since October 2009. 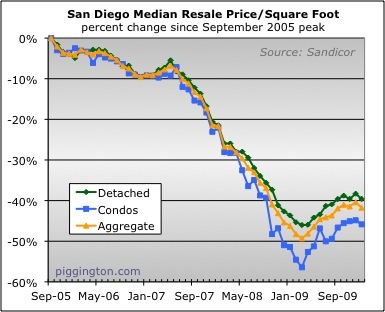 The median price per square foot for detached homes didn't budge between October and November. This fit nicely into the "flat-to-down" home price thesis I've been advancing in recent months. The 7.4% monthly rise in the condo median made for quite a poorer fit to my theory, however. I'd say the best part of July is not the lifting of the June Gloom, but the fact that I won't have to talk about the "double dip" any more. Well, maybe a few more times. Like now, for instance. You will recall that June was the last month in which first-time buyers could get both the $8,000 federal tax credit and the $10,000 state tax credit. The Feds later extended the June closing deadline to accomodate short sales, but they didn't announce that until more recently. Because people buying before the April deadline thought they had to close by June, the tax credit's effect should have been used up in June for the great majority of cases. It actually appears that the effect of the double dip may have been used up even before that. 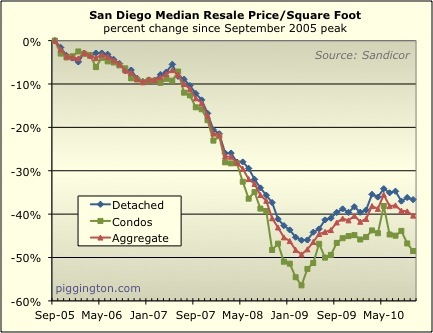 The median price per square foot actually fell in June despite the expiring stimulus. It dropped by a giant 10.6% for condos, more than erasing last month's almost-as-wacky gain. But even the far less volatile single family median price per square foot fell by 1.4 percent. Before we begin the Rodeo, you might be interested in a piece I just put up at voiceofsandiego.org on National Froth Day, when we commemorate Greenspan's first utterance of that legendary euphemism. Assuming you have now read the afore-linked piece, celebrated Froth Day, and eventually sobered up, let's move on the to last month's housing data. As discussed last week, the median price per square foot of San Diego resale homes rallied hard in March. The median price per square foot was up about 1% in February, but that's a smaller amount that its January decline. So I would characterize prices by this measure as continuing to go nowhere, as they have done since September. 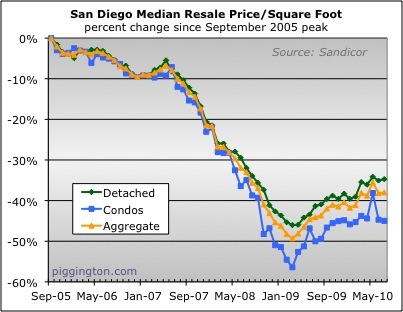 Prices by this measure have really gone nowhere since September 2009. As I noted at the Voice last week, the rally that began in early 2009 has clearly come to an end.